SellerActive is excited to announce our new partnership with Walmart marketplaces. Our new integration works seamlessly for sellers who already have approval to sell on Walmart. SellerActive can now help you expand your audience to over 80 million unique shoppers monthly! 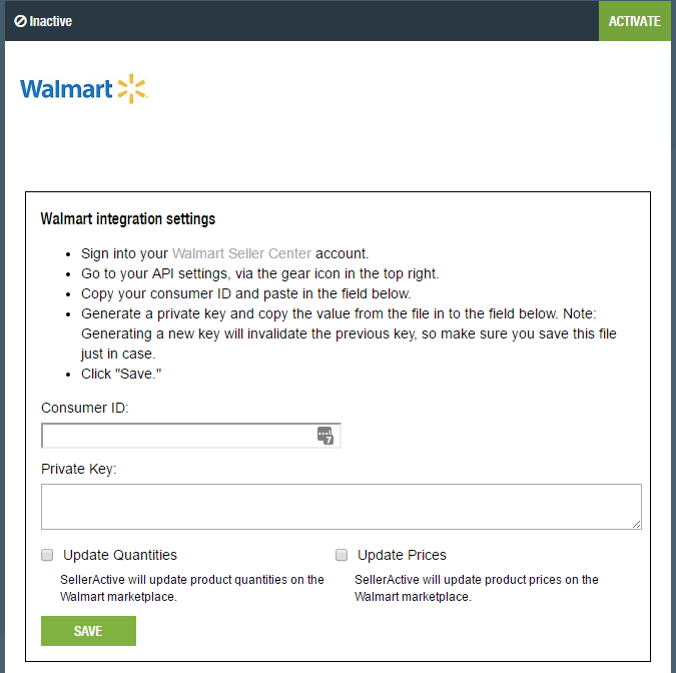 If you are a current Walmart seller and you are ready to use SellerActive, simply navigate to the integrations page and select the Walmart tile. From there you will be prompted to enter your consumer ID and Private Key information. SellerActive can also update quantities and update prices on the Walmart marketplace. If you have any questions about becoming a Walmart seller contact our team for more help and guidance with the restrictions that apply for Walmart marketplace applications at 1-800-545-7385. Before integrating their Walmart account with SellerActive new sellers must go through the Walmart onboarding process. For more information on becoming a Walmart approved seller visit the Walmart Marketplace website and request an invitation to begin the process. SellerActive is currently working on support for: return, refunds, cancellations and variations. At this time we will not be able to support these functions. We will update our customers as soon as these new functions are released.